#adrawingaday #onthetiles I decided to end the month big... on a double. The second half of this month became a massive Spanish fest and I've loved every tile of it :P When I found my photos of my time in Spain, there were a lot of pics of Park Güell otherwise known as Gaudi Park. There are so many mosaic works in and outside this park that it is one of the best examples of the potential of tiles on this planet ♥ In the entrance to the park there is a sign bearing the name of the park and of course, that too is a mosaic. I couldn't fit it nicely into the one drawing so I had to do two. I think there should be more creative, artful and decorative signs for parks, buildings, towns and homes in the world. Imagine how beautiful the world could be. I hope you've enjoyed my month of On The Tiles as much as I have. I still haven't decided what I am going to draw next month so I'm sure I will be as surprised as you when I post something tomorrow :P Keep on tiling. If you would like to purchase a drawing or commission a portrait, please get in touch. 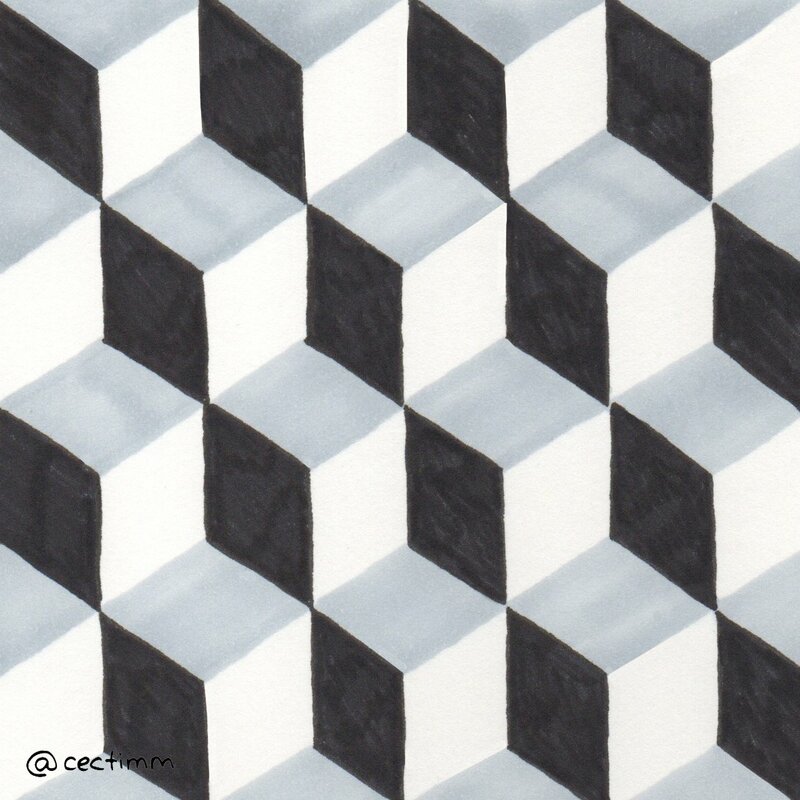 #adrawingaday #onthetiles This tile ensemble has been staring at me all month and I haven't noticed. It is the house number at the front of my house. I bought this for my mum when I was in Sitges in 1999 as I loved the colours and thought it would look great on the stone wall at the front of our family home. I didn't actually think my mother would hang it as she has a very stylish and minimalistic palette but she loved it and promptly had it installed next to the letterbox ♥ It's a lovely piece of our mother-country at the front of our house :) If you would like to purchase a drawing or commission a portrait, please get in touch. 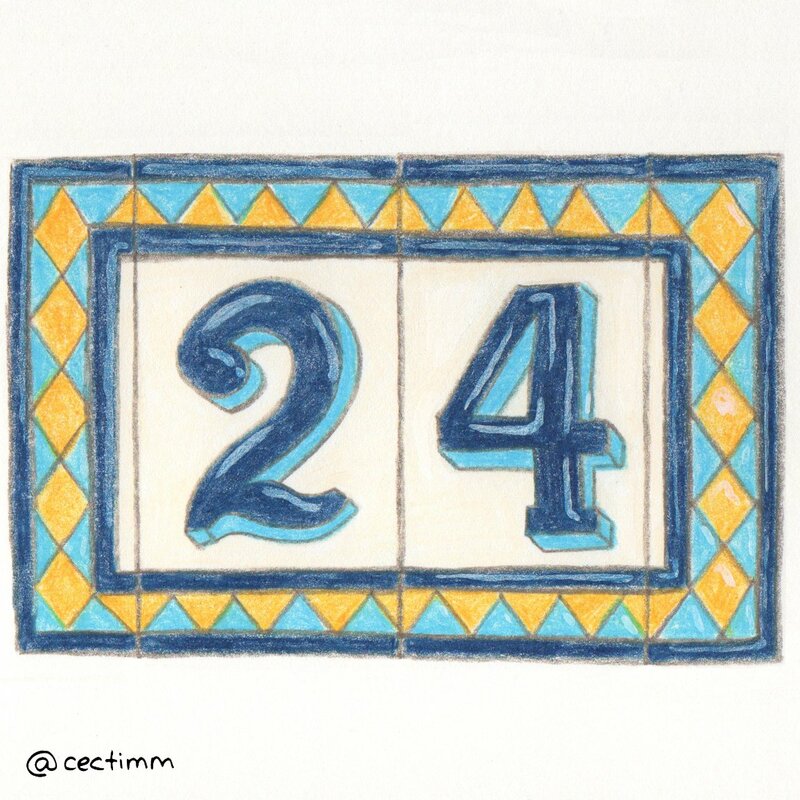 #adrawingaday #onthetiles I photographed this gorgeous tile artwork on the side of a building while walking through the narrow cobblestone streets of Sitges in 1999. I'm sure it's still there. The buildings are so old and there are so sooo many gorgeous tiles to discover on walls, beneath balconies and quaint hand-painted street signs. 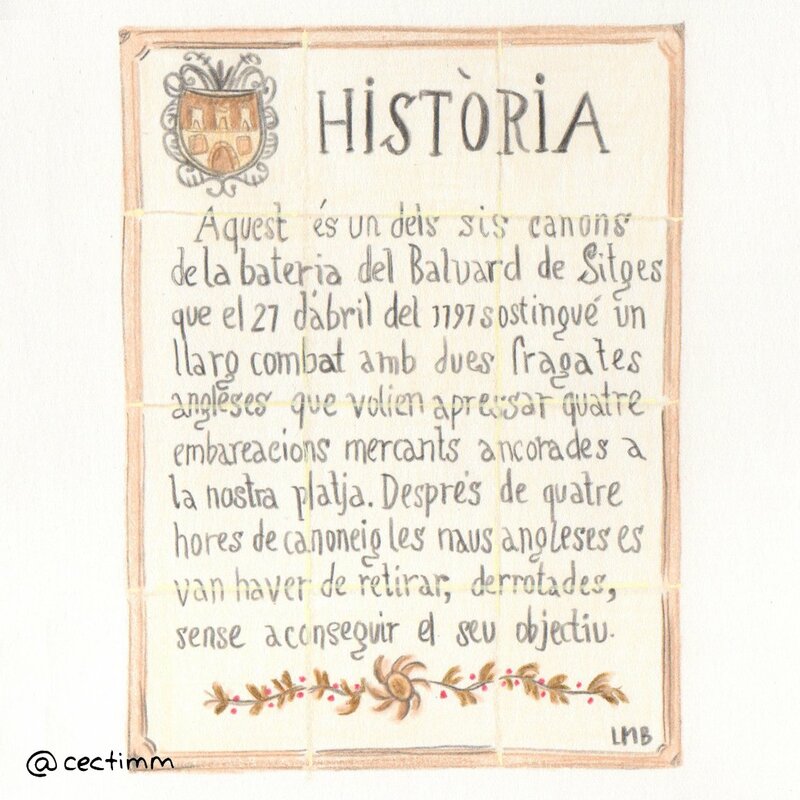 Tiles were once much more than utalitarian floor and wall coverings... they were artworks, place markers and a means of keeping historical records ♥ I have no idea of the meaning of this tile painting but I loved it then and I love it now. Someone buy me a ticket to Spain :P If you would like to purchase a drawing or commission a portrait, please get in touch. History: This is one of the six guns of the Baluard de Sitges battery that on April 27, 1797 sustained a long battle with two British frigates who wanted to hurry four merchant boats anchored on our beach. After four hours of cannoning, the English ships had to be removed, defeated, without achieving their goal. 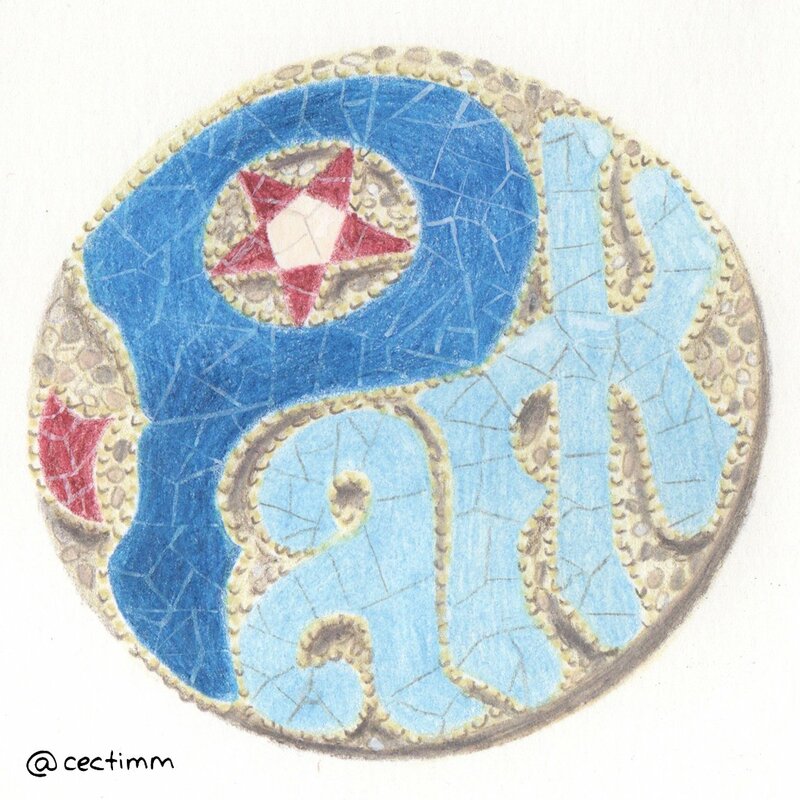 #adrawingaday #onthetiles Some friends of mine are having the most amazing European adventure and their recent photos of Park Güell Barcelona reminded me of the amazing tile work all throughout the park. The park was established in the early part of the last century within a natural park and was the brainchild of Antoni Gaudí. 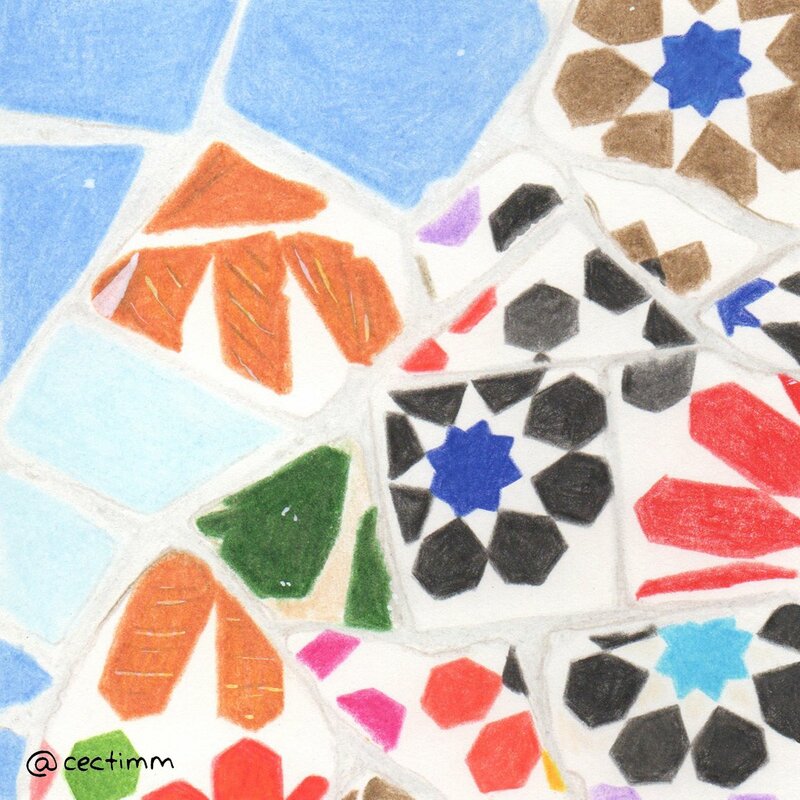 I visited the park in the late 90's and have fond memories and many photographs of the beautiful mosaic work on walls, seats and sculptures ♥ I love Gaudi's work so much. This is a close up of some of Gaudi's fancy mosaic work. If you would like to purchase a drawing or commission a portrait, please get in touch. 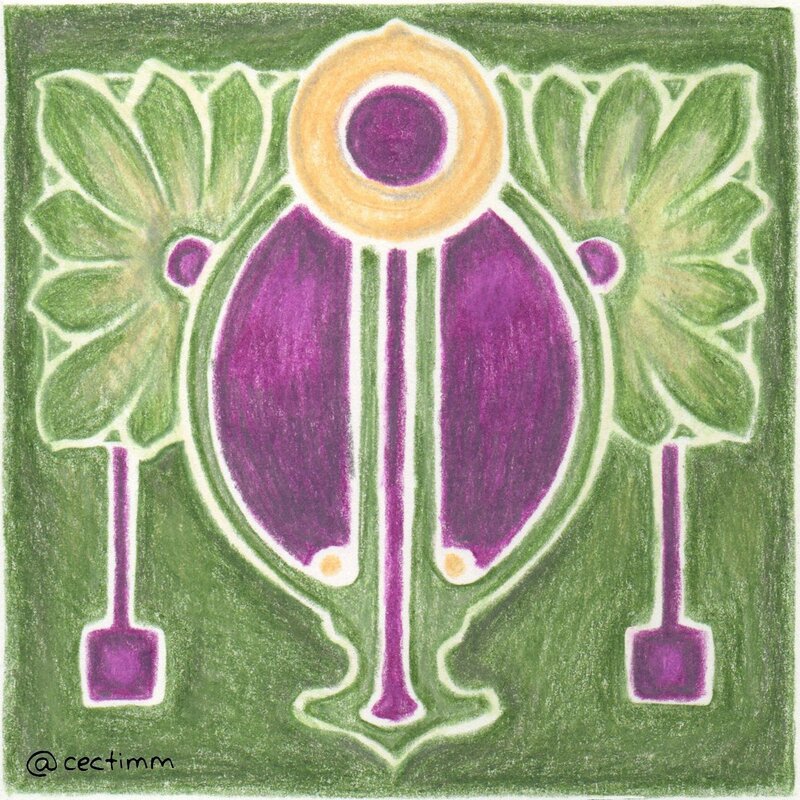 #adrawingaday #onthetiles I don't always love the colour combos of Art Nouveau but I do love the designs. So many vintage Nouveau designs could so easily be updated and revamped to be used in modern design and architecture ♥ If you would like to purchase a drawing or commission a portrait, please get in touch. #adrawingaday #onthetiles These colours really speak to me. They are so Spanish and they sit so well together. 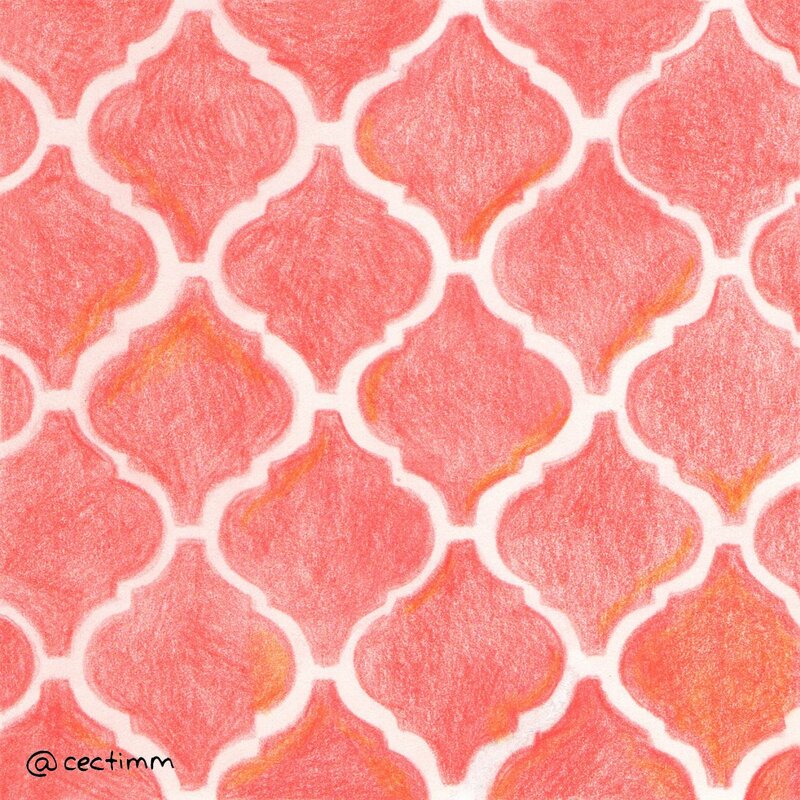 Maybe it's my Spanish blood that makes me love patterns and bright colours so much ♥ If you would like to purchase a drawing or commission a portrait, please get in touch. 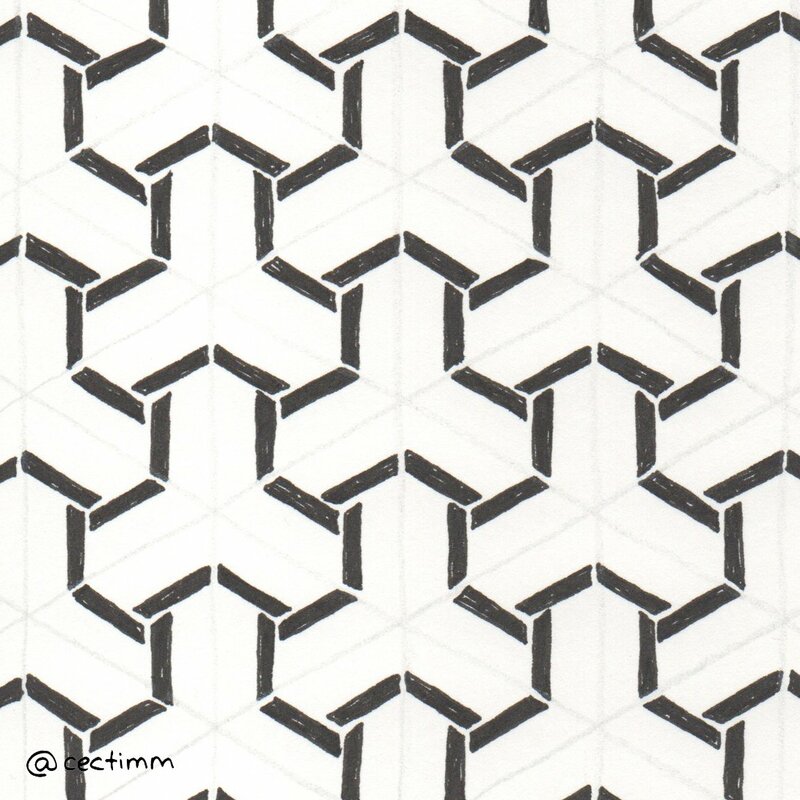 #adrawingaday #onthetiles The Art Deco era is so full of beautiful geometric designs... it's pure joy for a pattern junky like me. Beautiful monochrome designs graced the floors of the thoroughly modern architecturally beautiful Art Deco homes and apartment buildings ♥ Make sure you look at the floors of old buildings and find some gems for yourself. If you would like to purchase a drawing or commission a portrait, please get in touch. 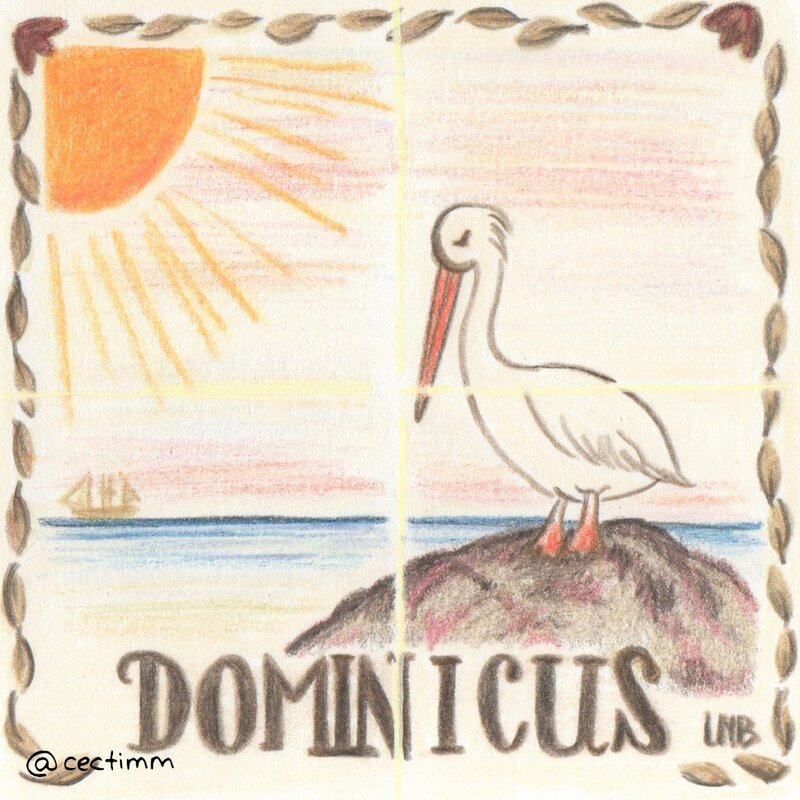 #adrawingaday #onthetiles This tile graced my parent's ensuite floor for my entire childhood. 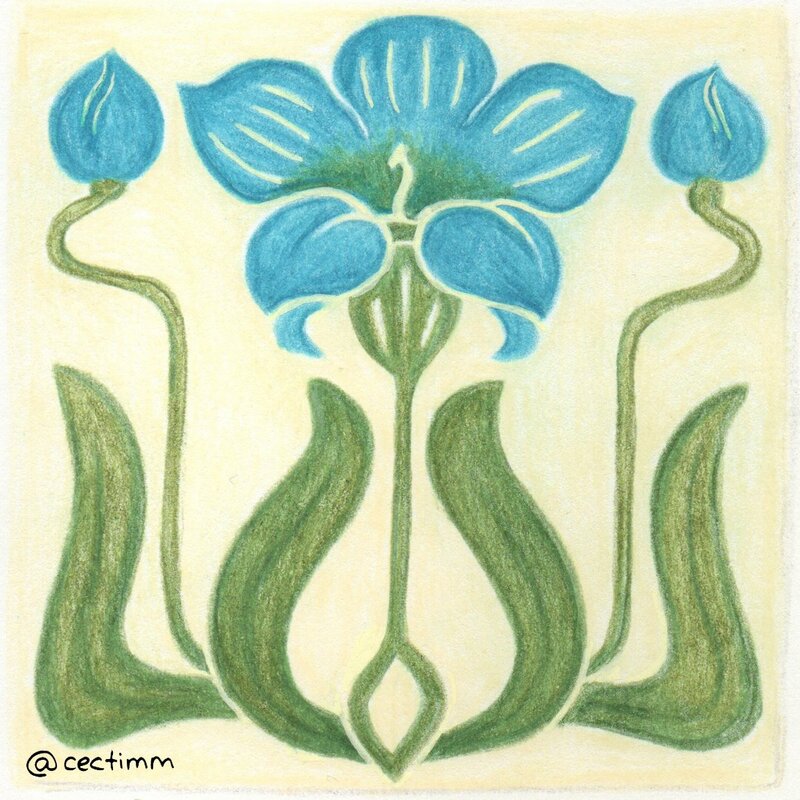 I often see it in cafe bathrooms and am reminded of the good old days ♥ A friend of mine had this tile as her kitchen benchtop - in bright orange - her house has now been fully refurbished and it's modern elegant design no longer accommodates this tile :P If you would like to purchase a drawing or commission a portrait, please get in touch. 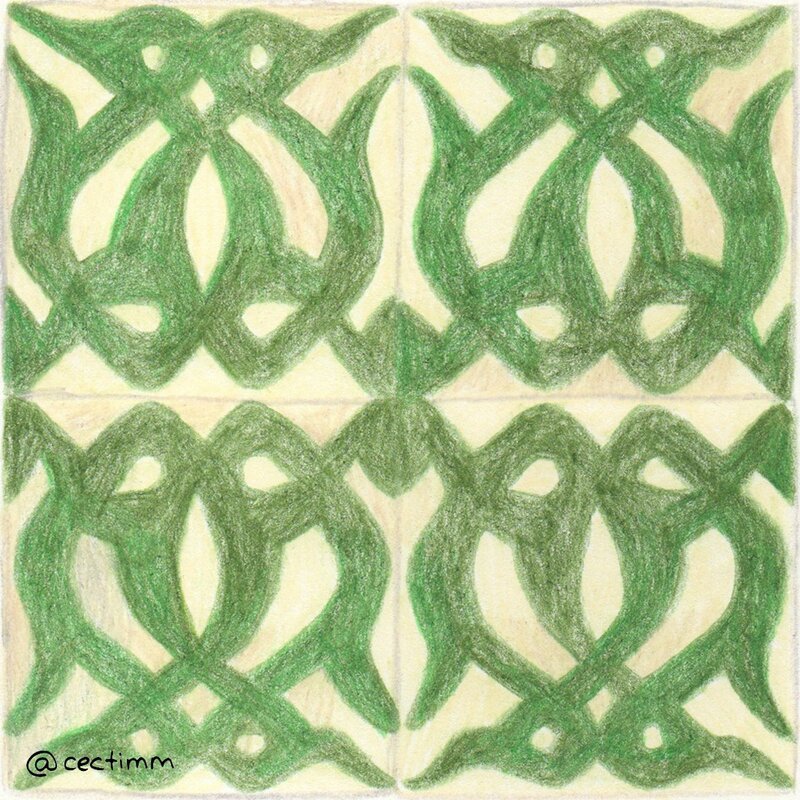 #adrawingaday #onthetiles This was listed as a Spanish design but there is clearly Arabic influence. There is a lot of Arabic influence in art, music and culture due to the conquest and occupation of Spain by the Umayyad in the 8th century. Once you identify the Arabic influence you can see it in almost everything. 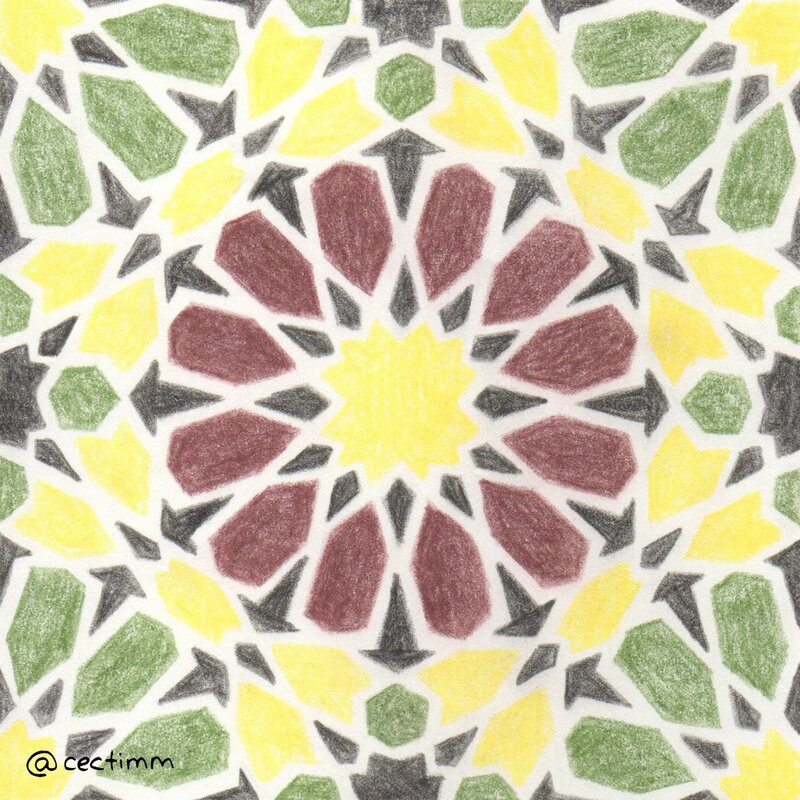 This pattern is so beautiful and geometric and I love the colours ♥ If you would like to purchase a drawing or commission a portrait, please get in touch. 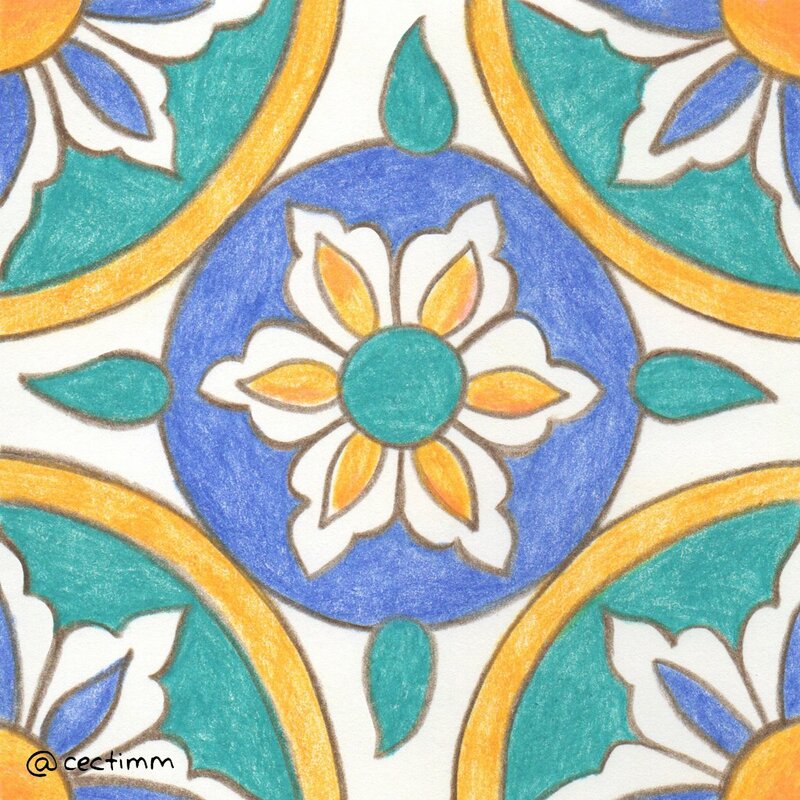 #adrawingaday #onthetiles There seems to be an infinite number of Arabic and Moroccan tile designs and I love them all ♥ There is something so peaceful and inviting about the repeated geometric patterns. 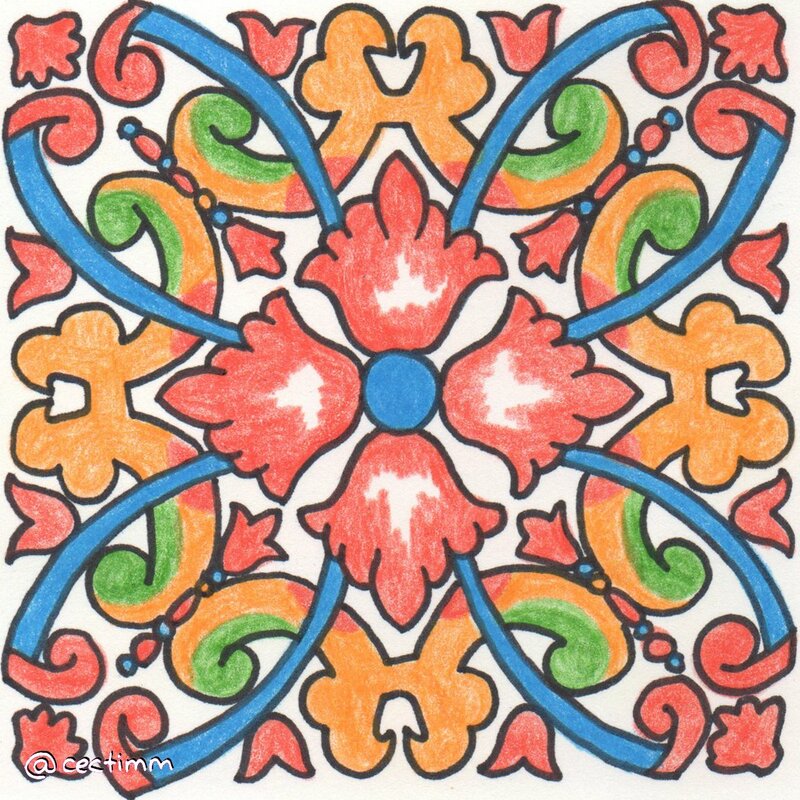 They look lovely close up and also when repeated... you can see the repeated patterns on my Instagram account. If you would like to purchase a drawing or commission a portrait, please get in touch. 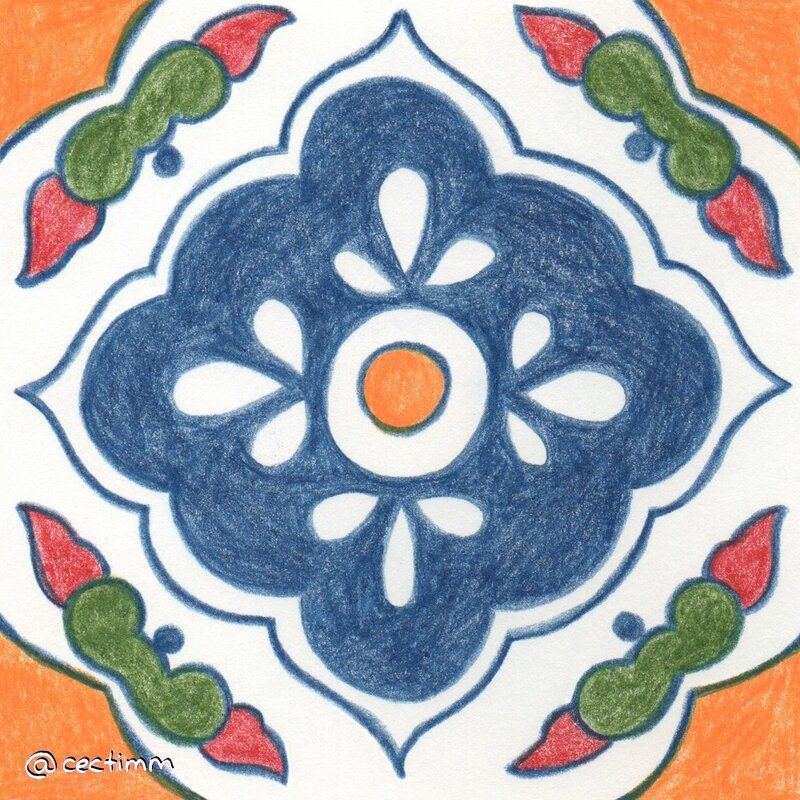 #adrawingaday #onthetiles Another beautiful tile design from my friend Joanne Stead the artist's personal Mexican Talavera tile collection. This one was in need of repair so at least now the paper version is in one piece :P Beautiful sunny colours and a wonderful naive and simple design ♥ If you would like to purchase a drawing or commission a portrait, please get in touch. 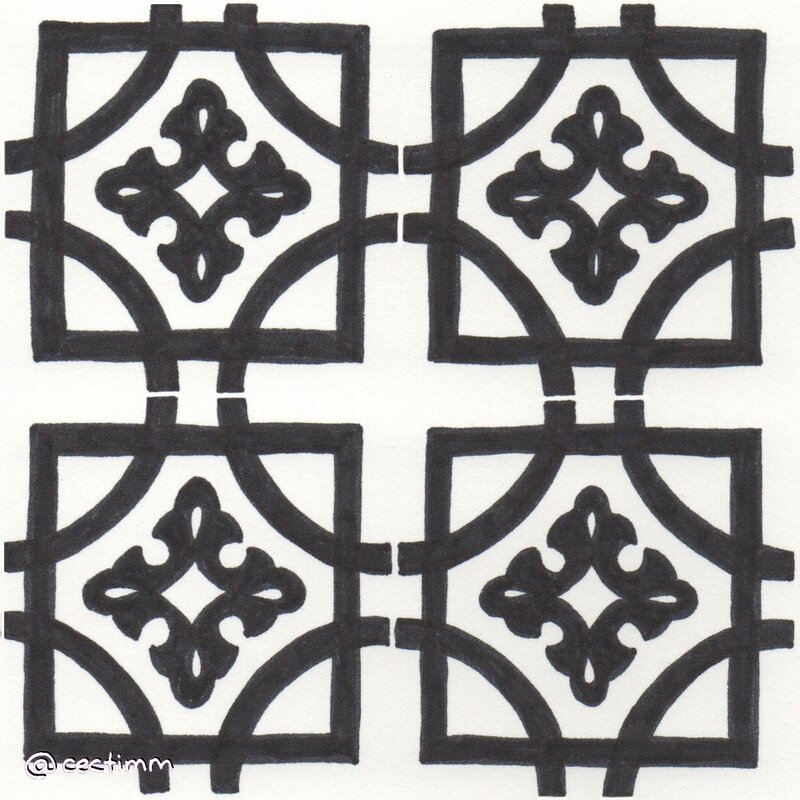 #adrawingaday #onthetiles I don't tire of black and white tile designs. They look fantastic in modern spaces as well as old-fashioned ones. I am really getting addicted to repeated patterns (as if I wasn't already LOL) ♥ If you would like to purchase a drawing or commission a portrait, please get in touch. #adrawingaday #onthetiles Having spent the last month drawing Frida Kahlo's wardrobe I feel even more in love with Mexican design and the bright colours they use. I didn't really think about the origin of the tiles I chose to draw this month but I am realising now that a lot of them are Mexican. Perhaps it is my Spanish blood but I love these bright simple colourful designs. If you would like to purchase a drawing or commission a portrait, please get in touch. #adrawingaday #onthetiles Art Nouveau was an internationally popular style of art, architecture and applied art that was most popular between 1890 and 1910. Art Nouveau was inspired by natural forms like the curved lines of plants and flowers. This art movement just preceded Art Deco and you can see how it might have influenced it. If you would like to purchase a drawing or commission a portrait, please get in touch. #adrawingaday #onthetiles A great artist and good friend of mine Joanne Stead is equally obsessed with patterns and tiles. She has a collection of Mexican Talavera tiles and some of them are broken. 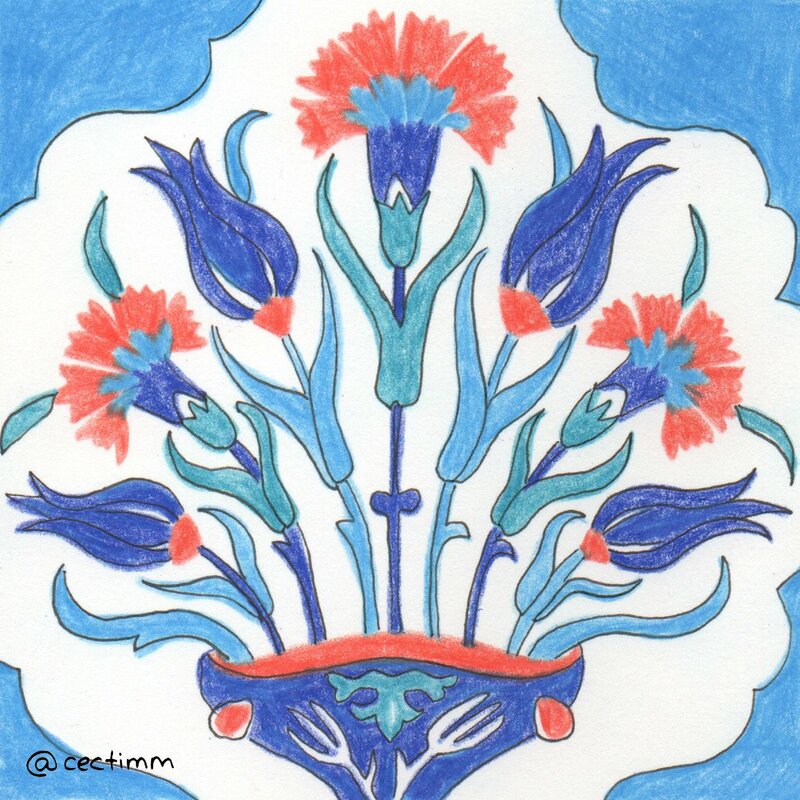 She kindly sent me some images of her favourites and I have repaired this one for her (at least on paper) :P Talavera pottery is heavily influenced by the Spanish colonial period of Mexico's history and has distinctive, rich and colourful old-world designs ♥ If you would like to purchase a drawing or commission a portrait, please get in touch. 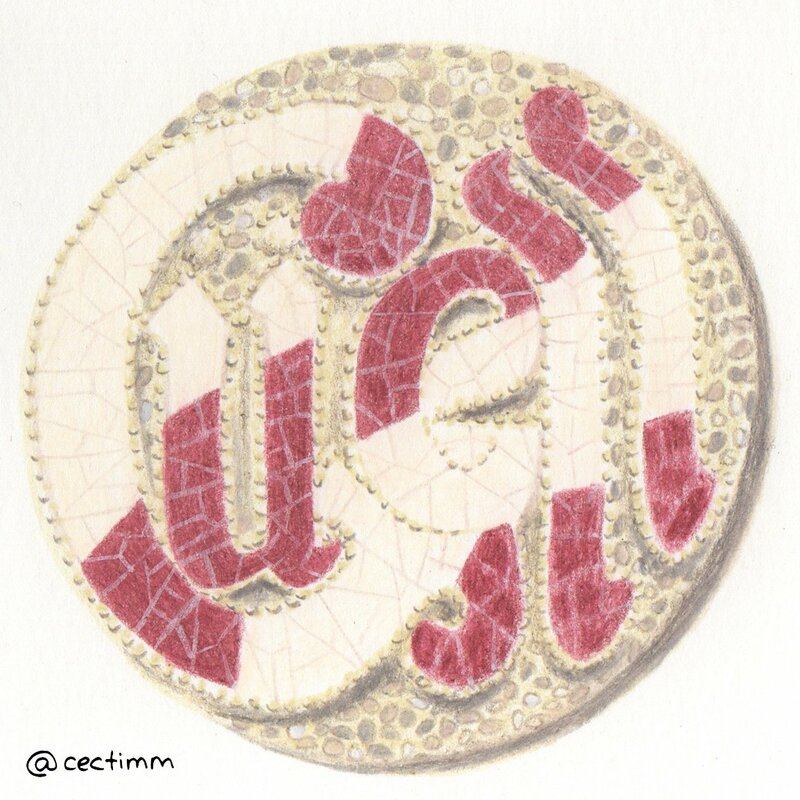 #adrawingaday #onthetiles I have no idea of the origins of this tile design... but it looks Spanish or European. These floral tiles were used sparsely as accent tiles intermixed with other patterned and plain tiles... often in a bathroom or used in a kitchen backsplash ♥ Pretty pretty flowers. If you would like to purchase a drawing or commission a portrait, please get in touch. #adrawingaday #onthetiles There are two distinct branches of Art Deco design... one is the minimalistic geometric school of thought and the other is the more decorative floral branch. 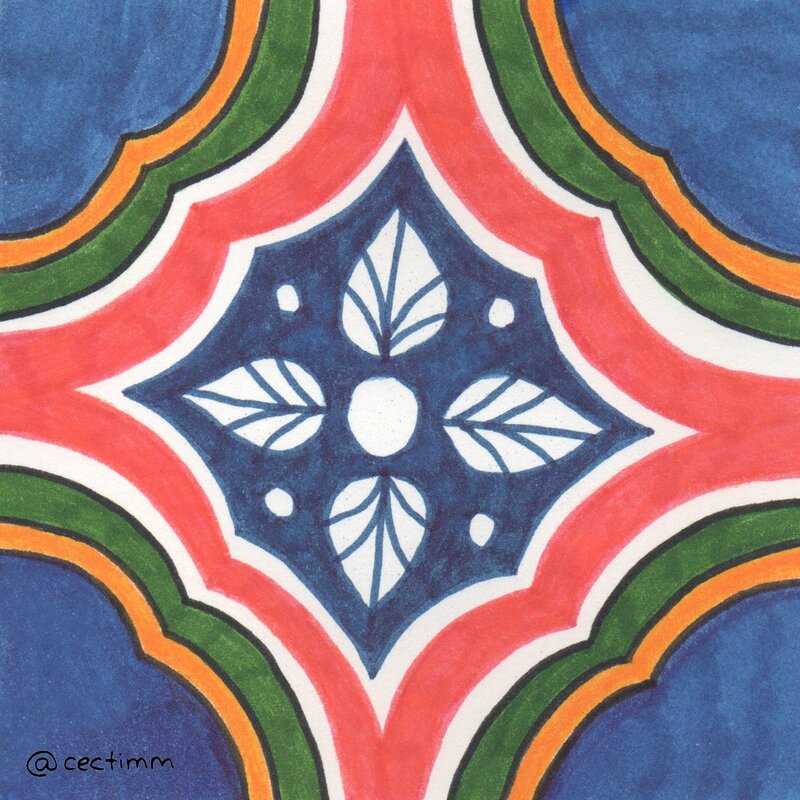 While I lean more towards the geometric designs, I still admire the floral designs and in particular their simplified forms and symmetry ♥ The amazing thing about these tiles is that they were hand painted. Factory workers stamped blank tiles with a stencil with charcoal and painted every detail with great precision. Amazing craftspersonship. There are still a few factories in the UK that produce restoration and custom designs in this manner. If you would like to purchase a drawing or commission a portrait, please get in touch. 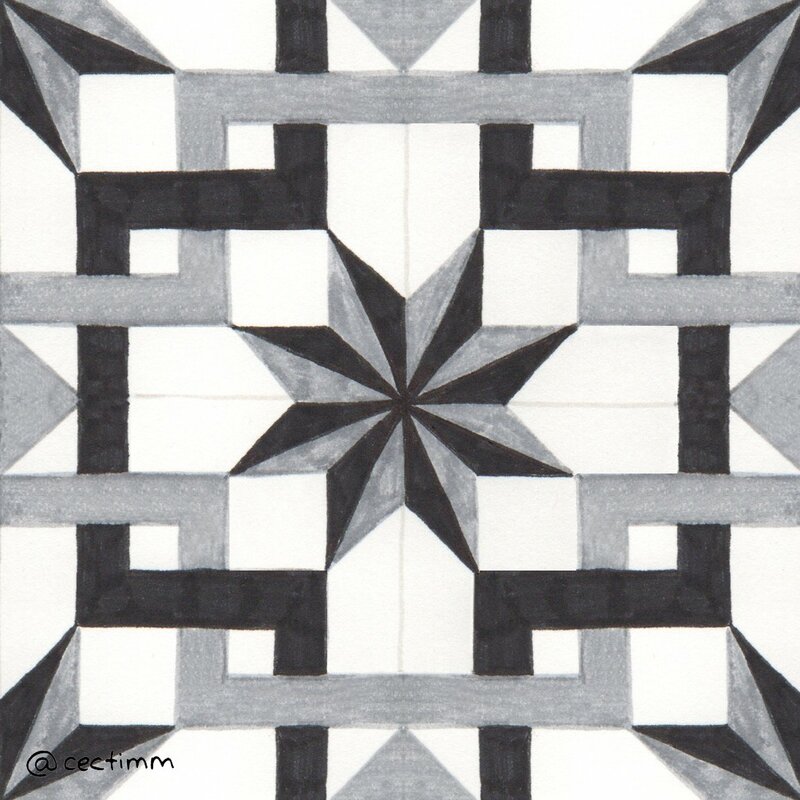 #adrawingaday #onthetiles Another black and white geometric design to round off the weekend. After a lovely day with family, I was late getting to this one. I love the simplicity of this timeless design and it almost always looks fantastic ♥ If you would like to purchase a drawing or commission a portrait, please get in touch. 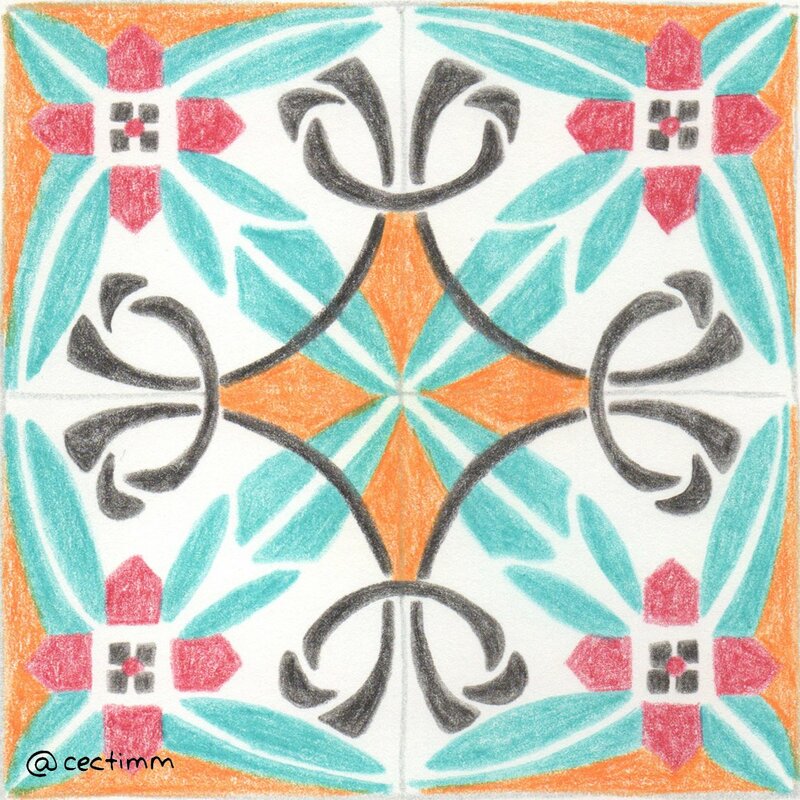 #adrawingaday #onthetiles When modern design references the past... this is an Art Deco inspired modern tile design that would look amazing on any floor ♥ As much as I love bright colours... I do love me a bit of monochrome. Black and white is king. If you would like to purchase a drawing or commission a portrait, please get in touch.